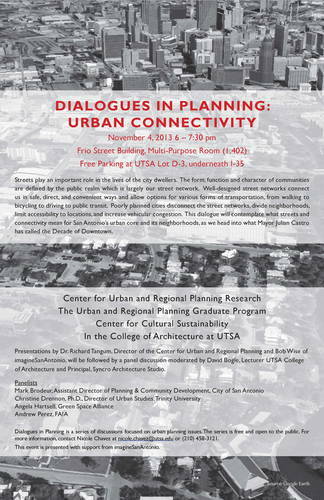 UTSA Center for Urban and Regional Planning invited me to moderate a panel discussion at their “Dialogues in Planning” forum next Monday, November 4th, entitled “Urban Connectivity.” Please join us and bring your questions for the panelists. Streets play an important role in the lives of the city dwellers. The form, function and character of communities are defined by the public realm which is largely our street network. Well-designed street networks connect us in safe, direct, and convenient ways and allow options for various forms of transportation, from walking to bicycling to driving to public transit. Poorly planned cities disconnect the street networks, divide neighborhoods, limit accessibility to locations, and increase vehicular congestion. This dialogue will contemplate what streets and connectivity mean for San Antonio’s urban core and its neighborhoods, as we head into what Mayor Julian Castro has called the Decade of Downtown. via Dialogues In Planning: Urban Connectivity | imagine San Antonio.